Accommodations: Attendees are responsible for their own meals. Packing a lunch is recommended. Course Materials: Attendees should bring a write-in-the-rain notebook, hand lens, writing utensil and plant ID book(s). Class Description: Two (2) day field class will cover the MiRAM system allowing all attendees to properly understand MiRAM Users Manual in order to complete the MiRAM Rating Forms. The MiRAM evaluates a wetland’s “functional value”, which includes a wetland’s ecological condition (integrity) and its potential to provide ecological and societal services (functions and values). 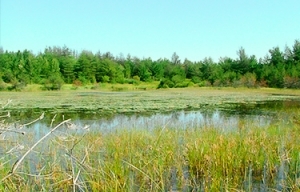 This training will provide general guidance in assessing a wetland’s “functional value” using the MiRAM. The training will include a combination of classroom and field instruction. On the second day, attendees will complete the entire MiRAM review individually or in small groups. This is a field course, participants should be prepared for varying field and weather conditions (rain gear, sunscreen, bug spray, etc. ).